How to Make an Easy Origami Fox! 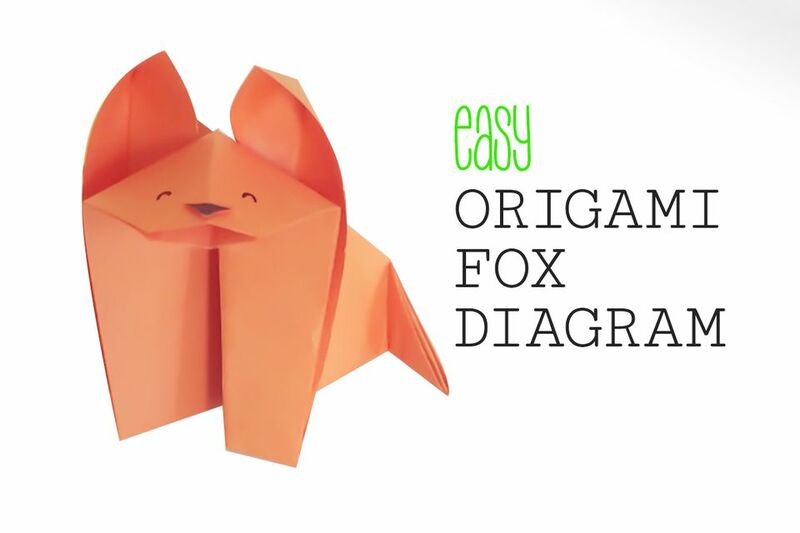 Learn how to make a super easy traditional origami fox with this easy to follow diagram! This origami fox is great for kids to make. This is my favorite traditional origami animal as the mouth, tail, and ears can be shaped differently to make new expressions, and you can also draw the eyes and nose differently too. You will need one sheet of square paper for this tutorial, I would suggest starting with the largest paper you have, maybe 20 x 20 cm so that you can easily follow the diagram. You can then use smaller paper and make a family of origami foxes! Why not make them a pretty woodland scene with some origami fir trees! If you'd like to try making some other origami animals, try the origami fish photo tutorial, easy origami butterfly or the easy origami swan. Start with your paper white side facing up. 1. Fold the paper from the top right down to the bottom left and unfold. 2. Fold the paper from the bottom left up to the top right. 3. Fold both the top left and bottom right corners up to the top right corner. 4. Fold the top left section diagonally behind and fatten the folds. 5. Fold the right over to the left approximately where indicated. - You can get different results by folding more or less here. 6. Fold the front layer back over to the right, keeping the back layer on the left, while pushing the top center layer down to form the fox's head. 7. Fold the tail inwards a little, shape the ears by opening up one layer of paper where the dotted lines are, carefully unfold them behind the fox's face. You can also leave the ears as they are! 8. Create a nose by folding the top layer of paper up where the dotted line is. 9. Fold the point of the top layer down to the edge and fold the bottom layer inside the mouth. 10. Now you can add some eyes and color in the nose if you like! You should now have a cute little origami fox!